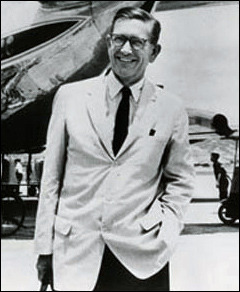 Fraser Wilkins: Mideast Oil of "Tremendous" Importance to U.S.
Fraser Wilkins (1909-1989) was a career U.S. Foreign Services officer, serving as director of Near East Affairs for the State Department and as the first Ambassador to Cyprus from 1960-1964. Between 1940 and 1971, he was stationed in Canada, Iraq, Morocco, India and Iran. In 1953, he was assigned to write a report to help resolve the Anglo-Iranian oil dispute, though he was not, interestingly, told of the CIA plot to depose Mossadegh. The postwar years seemed to concern three major issues of problems with the Near East: oil, communism, and the Jewish problem. During the war, from the observation post or reporting post in Iraq, did you anticipate there would be any kind of Communist problem in the area? That came to the fore, first of all, in Iran, but was there any anticipation of this going to be a U.S. problem? WILKINS: In those years we didn't worry about communism at all; the principal discussion which took place between the American legation and the government of Iraq was related to oil. I remember that the United States had, through the American oil companies, slightly over 25 percent of the Iraqi petroleum. And we only gained that earlier because of great pressure by American oil companies on the government to persuade the British to let us have a part of it. And I was told that some of the most acrimonious correspondence in the files of the State Department related to the American interest in taking part in the Near East-Middle East. James Forrestal is alleged to have said that the United States couldn't fight more than two years in a new world war without the oil reserves of the Middle East. Was that something that was on the minds of people in your office? WILKINS: Yes. And I remember very well Secretary Forrestal's attitude, because, on occasion, I accompanied Loy Henderson to the Pentagon for discussions with him, usually late in the evening. I remember one time Secretary Forrestal was due at some reception; he was dressed in evening clothes, and we stayed there in the Pentagon at least until midnight in sort of a general discussion with Secretary Forrestal about the situation in the area. So, generally speaking, in the Government, not only in the State Department, they were greatly concerned about the availability of petroleum supplies—going back, as I said in the beginning, to our interest in the oil of Iraq, not long after the First World War, and the desire of American companies to participate in the supplies of that country. Of course, we had more favorable arrangements in Saudi Arabia, and also in Kuwait, so all of this added up to a tremendous economic interest of the United States and also a strategic one. To your knowledge, did any Arab nation ever threaten to cut off oil? WILKINS: No, not to my knowledge. It was mentioned in the Arab press, of course, and you'd hear it said sometime, but not as a realistic step, because primarily they were dependent upon that oil; Iraq was, and so was Saudi Arabia. If we might pursue the subject of oil just a little further, Truman is said to have felt that the English acted very foolishly a year or two years later, when Mossadegh decided to nationalize the oil of Iran. There were proposals negotiated by Paul Nitze and George McGhee which would have lessened British influence but would still have given them a place in the old Anglo-Iranian oil combine. The British foolishly refused to concede to that. What was your opinion of that? WILKINS: There's no doubt about it, and it's incredible to me that the British, who pursued such a statesman-like policy immediately after the war, after [Clement] Attlee withdrew from Burma, Pakistan, India, Ceylon, and from Iran, and finally from Greece, Turkey, and Palestine, should have been so sticky about Iran with respect to the oil company and Mossadegh. But there again, I think they were under tremendous pressure from British commercial interests and thought that they could control the situation because of Iran's need for revenue from oil, not realizing that they were hurting themselves as much as they were Iran. Not only Nitze and McGhee were involved in that, but Harriman also went on a mission to try to soothe those feathers. Were you in . . .
WILKINS: I wasn't present in the State Department in 1953; I had just come back from India, where I had been stationed for almost three years. And I was not placed in NEA again, but up in the Policy Planning Staff, and so I wasn't aware of the detailed work that was going on in England and the United States with respect to Iran. I was asked by Robert Bowie, who was the head of the Policy Planning Staff, in July 1953, if I would write a paper—my first task—with respect to a solution for the Anglo-Iranian dispute concerning oil. And he asked me if I could have it ready in a month. "Well," I said, "Mr. Bowie, I've been in India for three years and I haven't had any leave." I said, "If you don't mind, I'd like to take at least two weeks." He said, "Okay, I'll give you six weeks to prepare the paper. You can take what leave you want in that time, but you have to prepare the paper." So, I went away for a brief period, and I came back and I started consulting everybody in the Department and elsewhere, about what had been happening in Iran, about Mossadegh, and so on. I wrote a paper recommending a solution for ending the dispute. The day I handed it to Mr. Bowie, Mossadegh was overthrown. As you know, the CIA, it is widely said, was responsible for Mossadegh's overthrow. But it is interesting that no one alluded to this during my preparation for this report. It was quite clear to me, however, that something was going on from the type of responses that I got from the other departments of government. But that wasn't the conclusion of your report. WILKINS: Not to overthrow Mossadegh. But going back to your earlier statement, it is lamentable I think that the British were not as statesmanlike about the Anglo-Iranian dispute as they had been about their withdrawal from these other countries. If they had, why they would be in a better position in the Middle East today. MOSSADEGH t-shirts — "If I sit silently, I have sinned"